VANCOUVER — Andy Goss is willing to step to the stage to accept some well-deserved praise, but he insists he is doing it for his profession, not for himself. He will be getting much more than a simple thank you at the annual conference for the Washington Secondary Schools Athletic Administration Association (WSSAAA), which begins this weekend in Spokane. 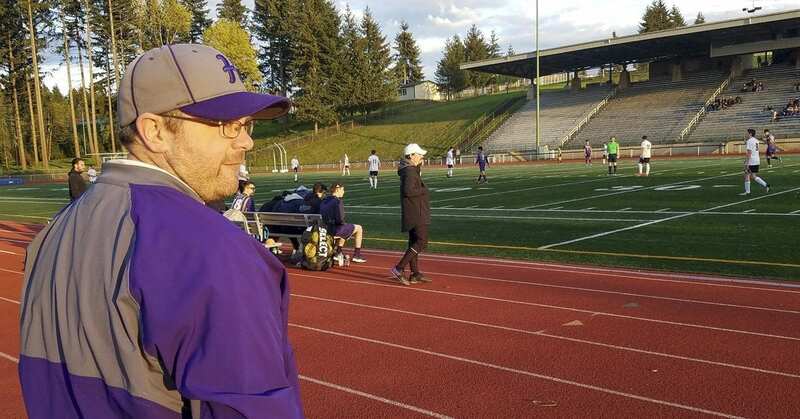 Goss, of Heritage High School in Vancouver, has been named the Medco Sports Medicine’s state Athletic Trainer of the Year — the first award of its kind. 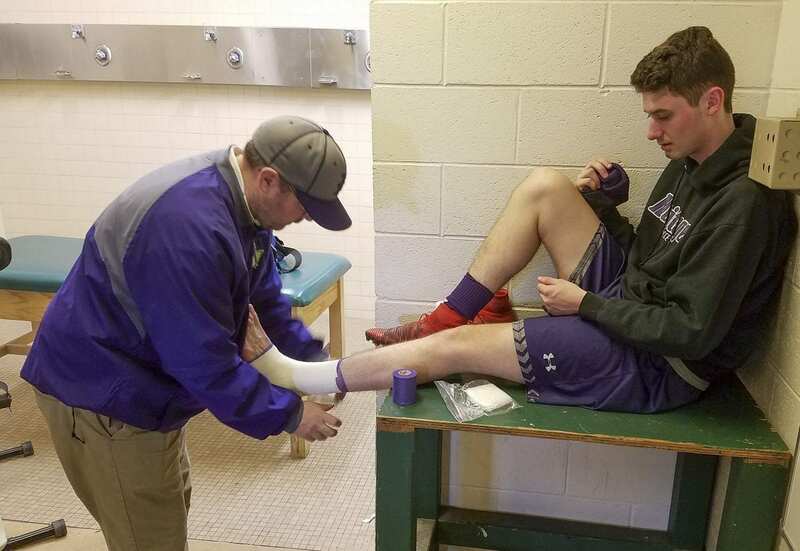 Still, the battle for athletic trainers through the years has been to get school districts to value their importance, to understand they are more than people who tape ankles. Medco’s award, and the fact that the WSSAAA is honoring the profession, means a big deal to Goss. Leta Meyer, Heritage’s athletic director, nominated Goss for the honor. 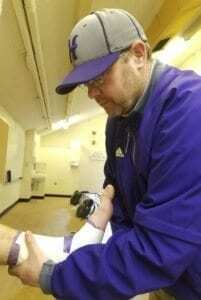 “Athletic trainers are an integral part of an athletic program,” Meyer said. “Andy is such a caring person. He is great with the kids. He really helps not only with their injuries but he helps them as a person, to grow and develop. It was Meyer who told Goss that he was the recipient of the first award. “What’s the word? Appreciated,” Goss said. Still, he is not convinced it should have been him. “There’s got to be someone out there who is more deserving,” he said. Maybe, but Goss has a lot going for him, too. Besides being an athletic trainer at Heritage, he is a full-time teacher, instructing students in medical science, anatomy physiology, and sports medicine. He runs HOSA for the school, as well, an organization for future health professionals. Goss also helps students put on a canned food drive as well as three blood drives a year. “Just giving back to the community when we can and how we can,” he said. As far as his job as athletic trainer, he is particularly proud of his involvement in the Zach Lystedt Law. Goss testified in front of committee before the state law was passed in 2009. The law requires youth athletes who are showing signs of a concussion to be examined and cleared by a licensed health care provider prior to returning to action. Athletic trainers at schools are key to recognizing some of the symptoms of a concussion because they know their athletes so well. “If there is any suspicion, no, can’t go back in,” Goss said. Athletic trainers are more than just the first responders on the field of play for an injury. Much of what they do, Goss said, is prevention of injuries through strength and conditioning and preseason checks on equipment. Those behind-the-scenes moments are appreciated by the athletes and coaches, but not necessarily by the public. In fact, a perfect scenario for an athletic trainer on game night is to not be seen. That means no injuries during a football game or soccer match, for example. “It’s a strange job, in that sense,” Goss said, acknowledging that just standing on the sideline would be ideal. This is Goss’ sixth year at Heritage, a place he loves. He grew up in Vermont and initially went to college to become a physical therapist. He changed to athletic trainer because he loved being around motivated individuals. The best athletes, he said, are willing to do the extra work, either in practice or in rehabilitation or in preparing their bodies for competition. He moved to the Northwest and found work at Ferndale High School before moving to work at Kelso High School. He and his family still live in Kelso, with Goss commuting to Vancouver every day.